This is the third of three standalone follow-ups to the First Law trilogy, each of which has combined fantasy with a separate genre. After a revenge story and a war story in his previous two books this is a fantasy Western, a previously unexplored combination of genres (at least in books I’m aware of) but one that does work reasonably well. By their nature Westerns are fairly low-tech and take place on the edge of society so it isn’t too hard to transplant the genre into an obscure corner of Abercrombie’s fantasy world. At times it does feel like the book is trying to include as many Western tropes as possible – from a gold rush to “Indians” raiding wagon trains of settlers and, most significantly, the familiar Western storyline of an aging warrior forced back into the life of violence he has tried to escape. I’m sure there are probably plenty of references to classic Westerns throughout the book, but I’m not all that familiar with the genre so I probably missed most of them, although the TV series “Deadwood” does seem to have been a big inspiration. The main plot focuses on the efforts of Shy South, a young woman trying to live a peaceful life after a short and bloody career as a bandit, and her stepfather Lamb, an aging warrior with an ever darker past, to rescue Shy’s younger siblings who were kidnapped by a band of armed men who are taking a group of captured children into the wild mountains of the Far Country. To travel to the Far Country Shy and Lamb end up enlisting as guards for a wagon train of settlers crossing the plains in the hope of a better life in the town of crease which is at the centre of a gold rush. Along the way they’ll have to deal with raids from Ghosts (the book’s equivalent of the Indians in a traditional Western), rival factions battling for control of Crease, an ancient cult centred on the legacy of a long-dead demigod and a mercenary company sent by the Union’s Inquisition to hunt down the ringleader of a failed rebellion. To begin with the novel did get off to a relatively slow start, the book does have a large cast of characters and it does take time to introduce them all so the early parts of the journey of the wagons across the plain does drag a bit at times. A lot of time is also spent on the crisis of conscience of the mercenary company’s lawyer Temple at the brutal actions of his comrades as they aimlessly attack several harmless towns in a quest to try to track down rebels. Initially this subplot isn’t very compelling although Temple does become a more interesting and likeable character as the novel goes, particularly once he leaves the company and ends up joining the same group of settlers that Shy and Lamb are guarding. Fortunately, all that time spent on characterisation in the early of the novel does pay off in the later parts of the book and the second half is much stronger than the first as the plot becomes more complex with Shy, Lamb and Temple having to both try to survive an increasingly bitter battle for control of Crease and also figure out how to confront the mysterious Dragon People, a tribe from a remote mountain stronghold who employed the men who kidnapped the children. 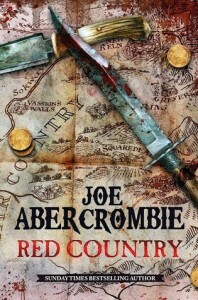 Characterisation has always been one of Abercrombie’s strengths and I think it has improved since his earliest novels. In the First Law trilogy one flaw of the characterisation was that while the main characters were interesting and well-developed characters the supporting characters sometimes felt a bit caricatured and simplistic. His last book, “The Heroes”, had improved characterisation of secondary characters and same is true here with a number of memorable characters in both large and small roles. There are a number of returning characters from previous books, perhaps a slightly implausible number considering how far away the events here are from the previous stories. In a couple of cases the characters have changed their identities, but even if it hadn’t been widely reported in advanced publicity for the book it wouldn’t be too hard to work out Lamb’s real identity and one of the highlights of the book is to revisit one of the major characters from Abercrombie’s previous books as an older and wiser character but one who has not managed to escape his previous flaws. There are also welcome returns from other characters such as duplicitous mercenary commander Nicoma Costa as well as some references to wider events involving characters who don’t appear in the book but might play a more major role in the upcoming trilogy. Although some of the returning characters might be the biggest attraction there are also some good new characters with both Shy and Temple getting good character development through the book and Shy’s defiant younger sister Ro is one of the best characters as she tries to deal with being kidnapped. There is plenty of action throughout the book including a lot of violence ranging from one-on-one duels to pitched battles but there is also plenty of Abercrombie’s trademark humour to add a bit of lightness to what is a fairly dark story. While some of his earlier books did have a formula of often going for a cynical outcome where even an apparent victory was more of a defeat there is a better variety of plot developments here. There are still a number of events which show that even good intentions don’t guarantee a good outcome but not all the attempts at heroism are futile and the book ends with a satisfying if slightly bittersweet ending. The slow start does let the book down slightly but the later stages of the book aren’t too far behind Abercrombie’s best work, although “Last Argument of Kings” and “The Heroes” are still his best books.